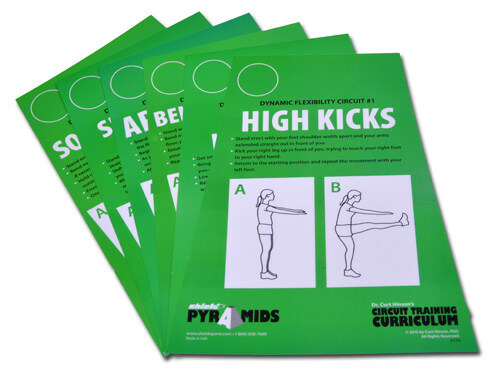 Dr. Curt Hinson’s Circuit Training Curriculum Pyramids are 18” high, made from super durable plastic corrugated. Easy to set up for instructors, easy to follow for students. Designed by Dr. Curt Hinson, author of Trouble-Free Playgrounds and director of PE workshops nationwide. Training Pyramids make physical activity fun and fast. An economical way to get students moving and keep them in top condition. Collapsible and stores flat. Slot-and-tab assembly. Can be used for other activities like targets, hurdles, or goals. Starter set includes 6 Plastic Corrugated Pyramids with 6 laminated station cards for Basic Fitness Circuit #1. Additional circuit cards sold separately. Pyramid base color: red or blue. Set of 6 super durable pyramids in your choice of red or blue. Set of 6 super durable pyramids in a rainbow of colors. Set includes one each in blue, red, yellow, purple, green and orange. 824-829 are available in English only. 500-505 are available in English only.